Myth II: Soulblighter Version 1.7 Released Along With a New Demo! After thousands of hours of sweat and blood, Project Magma, a dedicated group of artists, programmers, and gaming fanatics, is pleased to announce the release of patch 1.7 for the game Myth II: Soulblighter. This RTS classic runs faster and smoother than ever, and the gameplay is just as fun and brutal as it has always been! 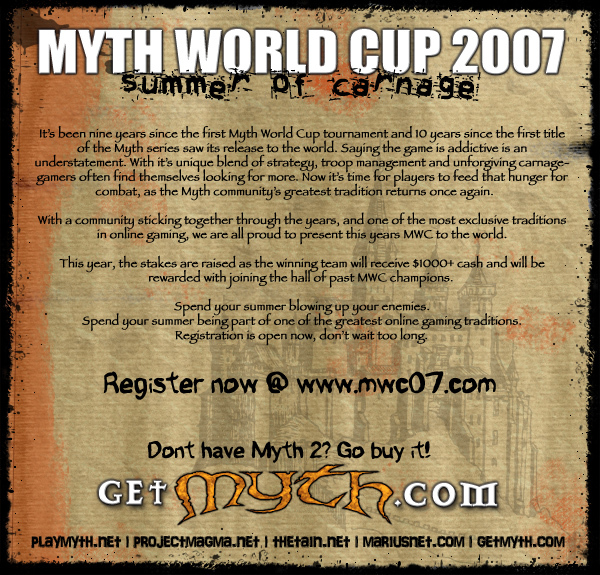 Myth II Version 1.7 is the latest result of the community-based effort to continue the tradition of improving the game. Myth II runs better than ever with accelerated hardware rendering on both Windows XP and Mac OS X platforms, while keeping support for the hardware it was originally designed for. Overall game responsiveness has been improved, and many old causes of crashing and out-of-sync gameplay have been eliminated. Dozens of annoying bugs and oddities have been fixed, making this update the most stable ever - rendering the Myth experience that much more enjoyable. Among the many new features in this update are support for hi-res quicktime cutscenes, a dialog that locates missing plugins on the tain, a resizeable overhead map, transferable unit trading if a team captain drops, and a new detail texturing system. Taking full advantage of the new detail texturing system available in Myth II 1.7, Project Magma is proud to present Bungie Map Textures. Bungie Map Textures is an optional add-on plugin featuring detail textures for all the original Myth II solo and multiplayer maps. Experience your favorite levels as never before, in stunning high-fidelity high-resolution 24 bit glory! With a new patch, a free on-line game server populated by die-hard gamers, and dozens of newly-released mods available for download, there?s still plenty of action left in this classic game. So what are you waiting for? Download the goods and charge into the fray! Don't own Myth II? Download a free demo of the latest version of this game here! The Myth II 1.7 Read Me, including the full list of changes can be seen here(PDF). The fine folks over at Mariusnet have just redesigned their website. The redesign merges the old Mythforums website with Mariusnet as well as adding a new clean interface. I never really understood why those were 2 different sites with different logins, so merging tham makes me happy. You can find the site at http://mariusnet.com. * New Accounts - the web accounts here and your game server accounts are one and the same. If you register an account here, the server account is automatically created. If you change your password here, it changes on the game server. * Clan - All Clan management functions have been moved here. Creating, Leaving or Joining a clan has never been easier. Just start a clan and send out some Clan Invitations. Joining a clan is as simple as the click of a button on your invitation. * Plugins Center - Has been moved here from MythForums and it has been given some updated functionality. I expect this to receive still further updates. I hope this will help encourage people to move from Playmyth to Mariusnet. It's a great server, and now easier than ever to setup an account. Project Magma is proud to announce a new update of Bungie's classic addictive real-time tactical game, Myth II: Soulblighter along with The Tain a file hosting archive dedicated to the �Myth� series. Myth II version 1.6, adds native MacOS X map making tools along with a Universal Binary for OS X. Not to be left out the Windows version received some modernization that drastically cut down startup times, allows the game to be played in a window, and shares the CPU better with other tasks. The Tain is a moderated file hosting site for the Myth and a central site for the community to find and download plugins, updates, and tools for the entire Myth series. So head on over to TheTain.net, grab Myth II 1.6, then play Myth and have fun. After Rand, Perrin's childhood friend, conquered the Stone of Tear and was declared the Dragon Reborn, Perrin heard rumours that the Children of the Light had been terrorizing the Two Rivers. They were actually trying to get Rand to return, but Perrin did it instead, bringing Loial, Faile and their Aiel friends Gaul, Bain and Chiad. After a harrowing passage through the Ways, they arrived at Emond's Field to find Perrin's family dead, and not only Whitecloaks but Trollocs in the area. While the Two Rivers folk waffled, Perrin took charge, not because he wanted to be in charge but because he knew what to do. He united the Two Rivers region and repelled both forces.